The Free Trappers will host their Great Southern Turkey Shoot for flintlocks and caplocks at Millmerran. A group of Free Trapper stalwarts have planned for several months to attend the Millmerran Rendezvous in strength this year – a trek close to 1000 miles (in old speak) for several. Seven or eight hivernants plan that travel in a random mule train with several side paths investigated along route, then dinkum primitive camping for the whole event. Visitor clubs are encouraged to put on an event of their own, so the SCFT have decided to transfer our Great Southern Turkey Shoot to enlighten Queensland pilgrims on how it is done. Five differing steel pop up / fall over turkey targets will be positioned at varying distances between 20 and 60 yards. Trappers will run the event and score and have much fun doing so and ensuring that the judge’s decisions are final. Peter Convey has made the targets to represent the different angles that a turkey might show itself. Ian Convey is responsible for the wonderful paint job bringing these turkeys to life; but the contestants will be required to attempt their own life-like imitation turkey gobble-gobble sounds. There’s some fun and giggle for everyone. There is only one winner in a true primitive shoot. Our winner receives a magnificent powder horn made and scrimshawed by Ian Convey and commemorating “Millmerran 2017”. Don’t ya wanna have fun no more? 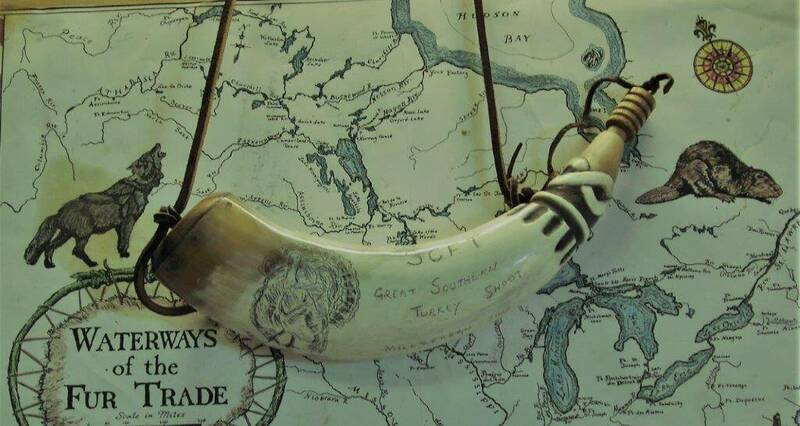 Great Southern Turkey Shoot winner gets this nice commemorative powder horn with scrimshaw by Ian Convey. Barely more than a handful of Hivernants attended our Easter rondyvoo! Four members of the Convey clan, being Peter, Noah, Murray and Ian were joined by Charlie Timma and Matt McMurrich to erect camps on Friday and set to gathering a sufficient supply of firewood. We put up targets after breakfast, filling a dozen empty GOEX cans with water and set up some wooden blocks that Peter had cut. Matt spent a good part of the day shooting and sighting in his new 54 cal flinter. We watched the ball inching up the target as he filed the foresight down, an accurate rifle it be. Matt is in love with it. The afternoon was spent plinking at various targets as we fancied. 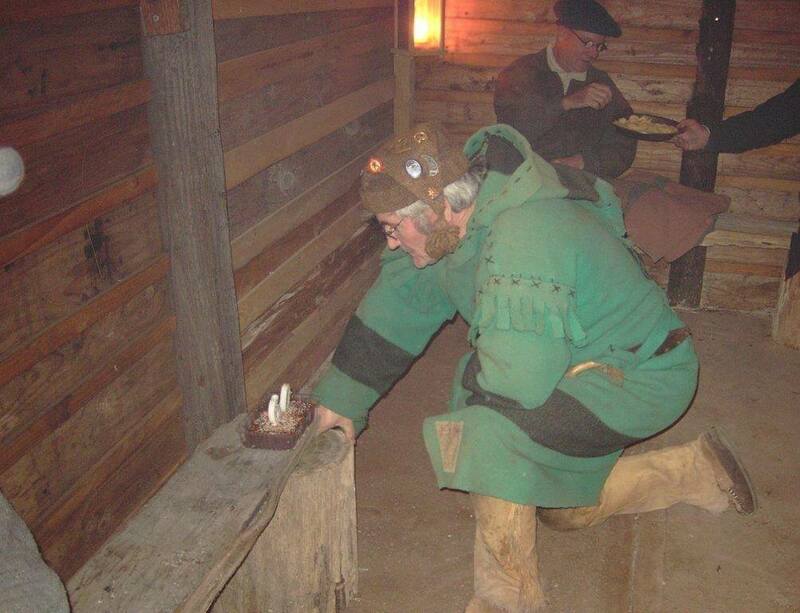 On Saturday evening, we gathered in the open-faced shelter and a surprise birthday cake was produced to celebrate Murray’s 60th. Of course, it had the correct number of candles for Murray to blow out after we all embarrassed him with a robust rendition of the Happy Birthday song. 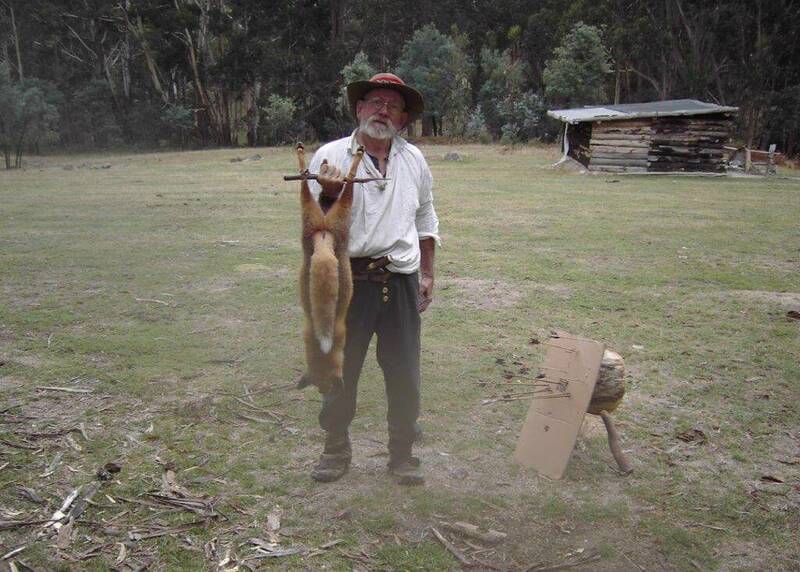 Next morning Charlie was up early again, this time fox hunting with his 12ga. He successfully whistled up and bagged a fat vixen having a rather nice pelt. Peter and Noah went duck hunting, Peter leaves Noah to it and returns to camp, Noah arrives back in camp about one and a half hours later, says he stalked woodies on the dam, jumped them for a shot and had a flash in the pan, those ducks didn’t hang around for a reprime. Mid-morning, we shot the GOEX cans of water. Disappointingly there was no spectacular explosions of water, only neat entrance holes and fist sized exits. We surmised that for the effects of exploding cans one would require modern high velocity suppository rifles. The rest of the day was spent just talking, eating, drinking coffee and some folk having a nanny nap (Peter & Charlie the poor old darlings). Come Monday morning, we all packed up and departed, a good time was had by all. When casting round ball, lead shrinkage due to cooling is 6 thou to the inch. Thus, a single cavity ball mould of 2.515” should cast a 2.5 inch round ball. There’s no real need to know that, but I just thought I’d tell ya. Stocks of smaller, more popular sized round ball, shrink the more you shoot, as you do wanna have fun blasting away at targets up the range. Damn me if I don’t miss the smell of that black powder burning as I write this nonsense. Well I missed the Trappers Easter Rendezvous for the very first time, due to some problems with my other shooter. The years are taking their toll dammit. Even so I had decided I needed to take a short sabbatical from collating newsletter doings. So, I am again grateful to Ian for his report and photos on the Easter encampment on the Painted Pony Plains. Of course, we won’t mention that Carole King song “Up on the Roof” that the Drifters turned into a popular classic about the 1970’s. New statistics indicate that folks beyond the 70’s be well advised against mounting anything higher than a painted rocking-horse saddle. This vixen fell to a single blast from Charlie’s 12 gauge. Two candles – a 6 and an 0. Yes, a big Oh! Murray celebrates his 60th. Millmerran Open Rendezvous July 1st – 9th 2017 featuring Great Southern Turkey Shoot for both Flinters and Caplocks. Win a fabulous scrimshawed powder horn by Ian Convey. In response to our entreaty about a “Pipe brand” knife (Around the Traps, Vol 54 November 2015) I received a letter with photographs from Peter Hawkey, an avid collector of Pipe brand knives from Katoomba NSW, dated November 2015. Perhaps better known as just Hawkey, he is well known to charcoal burners and serious re-enactors throughout Australia. Peter wrote…“Read with much interest the last issue of “Around the Traps”, particularly the bit about the Pipe marked knives. I enclose 2 photos of same, the upper knife a butcher and the lower a “scalper”. …The Pipe trade mark is not limited to one company, but many makers copied it in the hope of increased sales on the back of the famous mark. …T. Williams of Smithfield was only one retailer selling the knives retail and wholesale. The London company who actually made the knives varied as did the shape and size of the “Pipe Mark”. 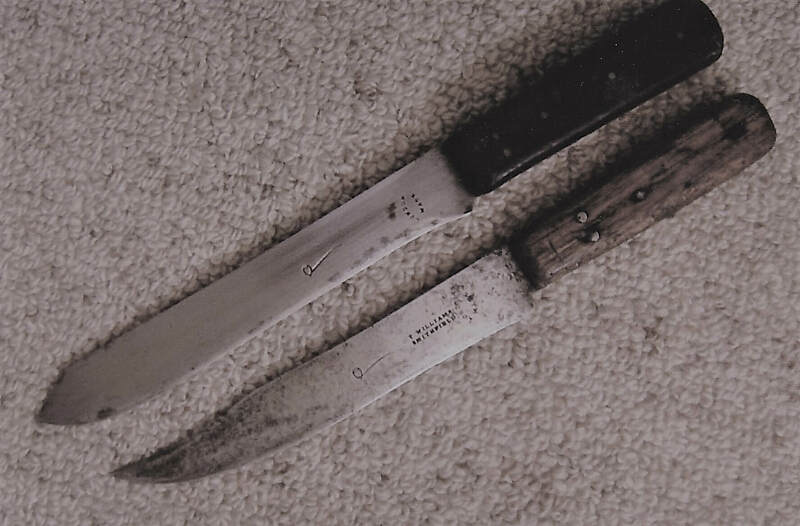 Two of Peter Hawkey’s Pipe Brand knives. The early Butcher has 5 steel pins while the scalper has 3 pins. …The fact there are 5 small diameter iron pins in the handle and no country of origin stamp makes them early as does the London stamp as Sheffield eclipsed London by the early 1800’s, and no orders were going to London as they weren’t industrial enough to produce the volume needed. Our original Primitive weekend still going strong and now including our 2nd Annual Turkey Shoot at Bernard’s Cache. I was lucky enough to come across a Pipe brand butchers chopper recently. It was in very poor condition so I restored it. It now looks ready for its intended original use. Thanks for sharing the photo and story Mr Hawkey. Damn that looks like fun! I have a .50 cal Lyman that needs to come out of the safe!!! !